Dr Jonathan Murray fears his new-born daughter might not be as harmless as she seems. The city is in flames and the authorities are losing control. As matters fall into frenzy, and as the lines between fantasy and truth, right and wrong, begin to blur, who will these two fathers choose to protect? Dark, propulsive and thrillingly original, this tale of fierce familial love and sacrifice fizzes with magic and wonder. 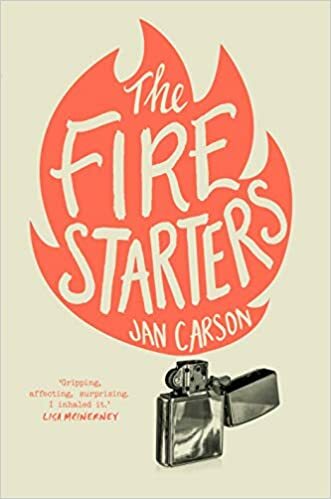 The Fire Starters by Jan Carson is set in a Belfast that seems quite recognisable with its sectarian divisions as well as cultural ones. However the book does stray from anything I would associate with normality fairly quickly. The first chapter left me a little puzzled and it was a while before I could get into the story. It is the Summer of the Tall Fires in Belfast and Sammy is concerned about his children. We then meet Jonathan (actually Dr Jonathan Murray a GP) and Sophie, his daughter. A strange book begins to develop. It is often dark and down to earth and at times poetic as it follows in the main these two threads that inevitably come together. Other characters do flit among the pages – a little oddly initially. However Jonathan and Sammy are the main focus of this book. We learn about the lives both current and past. Sammy has a background in the Troubles which is dark but felt authentic to me as did the rest of his story. However it is Jonathan whose story grabbed me and kept me engaged. To call it somewhat bizarre is probably something of an understatement however I felt myself smiling with at times and wincing too. For someone who seems unlikeable he is remarkably likeable! I don’t think I’ve ever read anything quite like The Fire Starters before. It puts a foot in the fantasy stream in a very effective way. It looks at life in Belfast in an interesting way. I guess to me it is about parenthood in the main and the way your views turn and change over time. I imagine I must be fortunate though probably quite normal to not have had to face what Sammy and Jonathan do. Some time after actually finishing the book I’m still not quite sure what I think and it. However I am glad I read it and it will stay with me for some time to come I’m sure.